Summary: A new study may provide key insights into the risk of developing Alzheimer’s disease. Researchers report people with higher levels of amyloid beta showed less activity in brain areas associated with working memory when engaged in cognitively demanding tasks. The new research, published in the journal NeuroImage, offers a window into when these increasing levels of beta-amyloid, widely known as a risk factor for Alzheimer’s disease, might reach tipping points in the brain, when regions crucial to memory begin behaving differently. Such points might foreshadow important milestones in the disease process. In all, participants in the study included 62 healthy adults from ages 51 to 94. Although the study is cross-sectional, rather than following the same individuals over time, this novel research offers a step toward better determining when in their lifespan an individual with rising levels of beta-amyloid might experience changes in the way the brain operates. A better understanding of these subtle shifts in brain function could lead to new insights into how Alzheimer’s disease progresses and possible ways to diagnose it earlier. “While there may be no outward sign of memory impairment, and no behavioral manifestations of memory issues early on, it is important to understand subtle shifts in the way the brain is functioning in order to understand the disease process with the hope of intervening before it is too late,” said Foster, who works in the lab of Dr. Karen Rodrigue, an assistant professor in the School of Behavioral and Brain Sciences. Subjects with higher levels of beta-amyloid, shown in red in this brain scan, showed less activity in brain regions involved in working memory as they engaged in a cognitively demanding task. NeuroscienceNews.com image is adapted from the UT Dallas news release. In addition to Rodrigue as the corresponding author, other CVL scientists on the research paper are Dr. Kristen Kennedy, assistant professor; and doctoral students Marci Horn and David Hoagey. “This work will likely prompt those in the field who are specifically looking for markers or milestones of when the brain transitions between different activation levels, to re-evaluate some of their data,” Kennedy said. Funding: The research was funded by National Institutes of Health and an investigator-initiated trial grant from Eli Lilly and Company for the Amyvid ligand. Image Source: NeuroscienceNews.com image is adapted from the UT Dallas news release. Original Research: Abstract for “Both hyper- and hypo-activation to cognitive challenge are associated with increased beta-amyloid deposition in healthy aging: A nonlinear effect” by Chris M. Foster, Kristen M. Kennedy,Marci M. Horn, David A. Hoagey, and Karen M. Rodrigue in NeuroImage. Published April 2018. UT Dallas “Brain Activity Study Offers Potential Insight into Alzheimer’s Disease.” NeuroscienceNews. NeuroscienceNews, 16 April 2018. 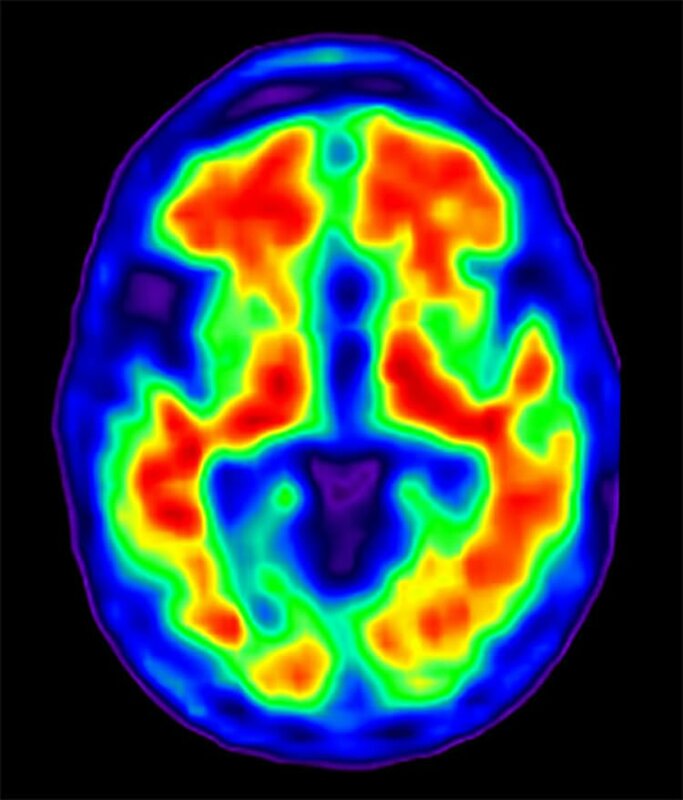 UT Dallas “Brain Activity Study Offers Potential Insight into Alzheimer’s Disease.” http://neurosciencenews.com/alzheimers-brain-activity-8803/ (accessed April 16, 2018). Beta-amyloid (Aβ) positive individuals hyper-activate brain regions compared to those not at-risk; however, hyperactivation is then thought to diminish as Alzheimer’s disease symptomatology begins, evidencing eventual hypoactivation. It remains unclear when in the disease staging this transition occurs. We hypothesized that differential levels of amyloid burden would be associated with both increased and decreased activation (i.e., a quadratic trajectory) in cognitively-normal adults. Participants (N = 62; aged 51–94) underwent an fMRI spatial distance-judgment task and Amyvid-PET scanning. Voxelwise regression modeled age, linear-Aβ, and quadratic-Aβ as predictors of BOLD activation to difficult spatial distance-judgments. A significant quadratic-Aβ effect on BOLD response explained differential activation in bilateral angular/temporal and medial prefrontal cortices, such that individuals with slightly elevated Aβ burden exhibited hyperactivation whereas even higher Aβ burden was then associated with hypoactivation. Importantly, in high-Aβ individuals, Aβ load moderated the effect of BOLD activation on behavioral task performance, where in lower-elevation, greater deactivation was associated with better accuracy, but in higher-elevation, greater deactivation was associated with poorer accuracy during the task. This study reveals a dose-response, quadratic relationship between increasing Aβ burden and alterations in BOLD activation to cognitive challenge in cognitively-normal individuals that suggests 1) the shift from hyper-to hypo-activation may begin early in disease staging, 2) depends, in part, on degree of Aβ burden, and 3) tracks cognitive performance.